Keep out of reach of children and pets. Ava loves her oils and I make diluted roller bottles for her. I also fill my empty oil bottles with a carrier oil and label them and those are oils she knows she can play with. Keep oil bottles tightly closed, cool, and away from direct sunlight. There are three main ways to use essential oils – aromatic, topical, and internal. Aromatic use is the safest. This can be done using a diffuser, putting drops on the floor of your shower, or simply by smelling the oil. Internal use carries the greatest risk and is best used to support a specific health situation. Oils should not be ingested as a daily preventative for extended periods of time. We have had great results with internal use but it is so important to know what oils can be ingested and to use them appropriately. The following are the dilution recommendations of Lea Harris, certified aromatherapist and founder of http://www.usingeossafely.com. 0.25% – 1% is recommended for children, pregnant women and the elderly. 1% dilution is 1 drop per 100 drops of carrier oil. There are 100 drops in a teaspoon so you don’t need to count them out like I did when I first started! 2-10% dilution is the recommended dilution for an adult. More on Lea Harris’ dilution recommendations here. This is a good way to start. 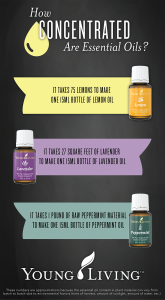 Young Living recommends less dilution and their dilution recommendations are on every essential oil bottle as recommendations vary depending on the oil. Dilution is a controversial topic in the essential oil world. For adults, I often find that I need to increase the potency recommended by Lea Harris to obtain the full benefit. Also, Lea recommends the same dilution regardless of the oil but oils are so different – gentle like frankincense to strong like peppermint to fierce like wintergreen – so it makes sense that dilution is tailored to the individual oil as Young Living does. I find myself somewhere in between Lea Harris and Young Living when it comes to dilution. In general aromatherapists feel it is best not to use essential oils neat on skin with the exception of lavender. Personally, I dilute lavender (not much though) and have had great results. I typically always dilute my oils. Depending on the size of a room, usually no more than 4-8 drops are needed in a diffuser. In a room with children, such as a classroom setting, only 1-3 drops should be put in a diffuser, depending on the size of the classroom and ages of the children. In Ava’s room at night, I use 1-2 drops. Peppermint, eucalyptus and rosemary are high in 1,8 cineole, also known as eucalyptol. The name 1,8 refers to the fact that the oxygen atom is bonded to the first and eighth carbon atoms. In general 1,8 cineole should be avoided in children under 10 years of age. This is because high 1,8 cineole can cause central nervous and breathing problems in young children. That said, I have used RC (which contains eucalyptus and peppermint) with Ava at 1% dilution starting at age 2 on her lung vitaflex points on feet for respiratory support and it worked very well. But caution should be exercised, especially for those starting out. This list of age-appropriate oils by Lea Harris details which ones are considered safe and unsafe for children. In a room with children, such as a classroom setting, only 1-3 drops should be put in a diffuser, depending on the size of the classroom and ages of the children. Oils I love for children include frankincense, copiaba, lavender, cedarwood, vetiver, sandalwood, helichrysum, roman chamomile, german chamomile, geranium, brain power, sweet orange and cypress. Photosensitive oils are oils that once you apply on your skin make your skin more sensitive to UV rays which could cause your skin to burn (called phototoxicity). Photosensitive oils include lemon, lime, orange, tangerine, mandarin, grapefruit, bergamot, angelica, ocotea and ginger. Young Living has many blends that are photosensitive because they contain these oils. After applying a photosensitive oil on your skin, you should not go out in the sun or to a tanning bed for 12 hours. The labels on the Young Living oil bottles let you know whether an oil is photosensitive or whether a blend contains a photosensitive oil. Oils in the bath are a great way to enjoy them, such as lavender for relaxation or panaway (for adults only) after exercise. Usually 3-5 drops is all that is needed for an adult and make sure you dilute them with bath salts or a carrier oil. The reason for this is that oil and water do not mix so the oil will sit on top of the water and strong oils could actually burn the skin.